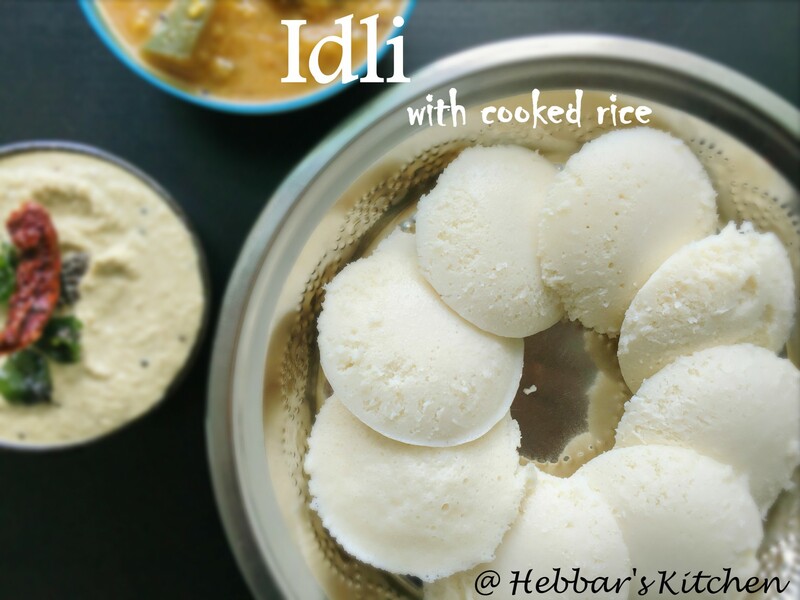 cooked rice idli | idli with cooked rice recipe | idli with left over rice recipe with detailed photo recipe. if you do have some left over rice, than this recipe is a must try recipe for morning breakfast. 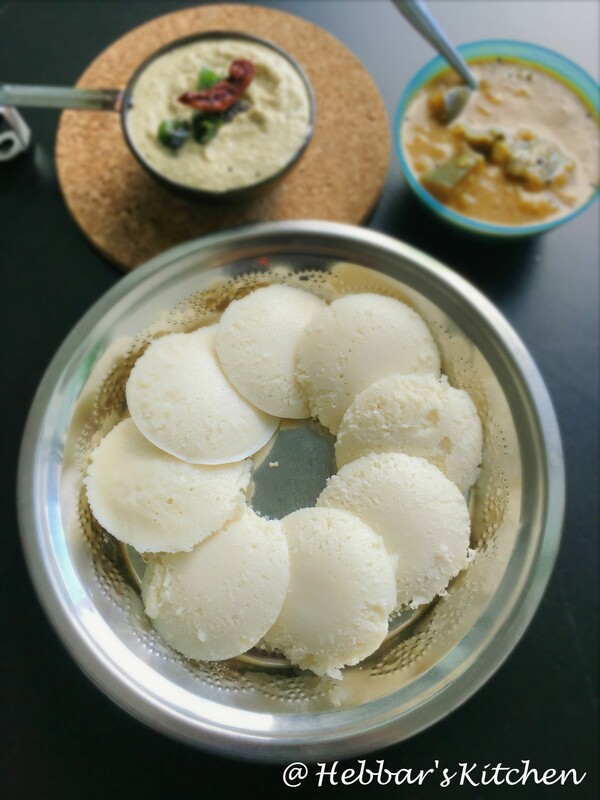 cooked rice idli | idli with cooked rice recipe | idli with left over rice recipe with step by step photo recipe. preparing tasty morning breakfast is always challenging for most of the people. at the same time, it becomes even more challenging to finish all the leftover stuff from previous day’s dinner. so why not have a idli from left over rice. isn’t it a good idea to prepare a delicious cooked rice idli from left over rice. cooked rice idli recipe will still deliver the same authentic taste. in this recipe i have used the combination of cooked rice and raw sona masuri rice. however, it is not mandatory to mix it together as you can simply use cooked rice for grounding. i was running short of cooked rice and i had to fall back to the raw rice option. if you are using only cooked rice, add 2 tbsp of rice flour to make it for thick. just before jumping into the recipe, please have a look at my other breakfast recipes, especially rava idli, idly with idli rava, mini idli, kotte kadubu also have look at my dosa, plain dosa, neer dosa, poori etc. soak idli rice / sona masuri rice and fenugreek for at least for 5-6 hrs. also soak urad dal in a separate vessel for 2 hrs. drain the water completely. you can use the same water for grinding. first grind the soaked rice with required water. make to smooth paste. take cooked rice in the blender and add little water and make it into a smooth batter. transfer this to a large container. now take urad dal in the same blender and add little water at a time and make it into a smooth batter. make fluffy batter and transfer this to the same container. cover and ferment in a warm place for 12 hours. take out the required portion of batter and refrigerate the rest of batter. grease idli plates with little oil. spoon the batter into each moulds. place this idli plates into steamer and steam for 8 to 10 mins in a medium flame. once it is steamed, remove it and let it cool for a bit. your idli with cooked rice or cooked rice idli is ready. serve it with chutney or sambar. don’t steam the idli more than 15 mins, or it will dry up. use an air-tight container for storing the batter. fermentation process takes around 8 hours. add in salt to required batter only. the remaining batter you can store in a airtight container and refrigerate. 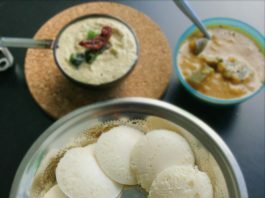 the idli batter turns sour quickly if you add while fermenting. very nice idli recipe using leftover cooked rice.very soft and fluffy idli .we all enjoyed with samber & coconut chatni.thanks a lot. You are simply amazing ! You have mentioned cocked rice only in the recipe, however, not shown it in the steps! You are doing great here , keep up the awesome work on! you are welcome Vishwa and thanks for such nice words. it is sona masuri rice. it is a variant of white rice. Madame I am from Tamil Nadu and am an ardent fan of your style and recepes. ESP as it is vegetarian. Can you please suggest how much urad dal needed if using only cooked rice ( 2 cups of cooked rice). Thank you. the quantity ratio should always be 3:1 for rice and urad dal. What are quantities if we use only cooked rice and no raw rice? what is the recipe if you use only cooked rice.. should we use urad dal too? urad dal is must for cooked rice idli. I live in Germany .For me it’s very difficult to prepare idli during winter as the batter doesn’t rise. Give me some tips regarding this. I have tried preheating oven. And I take 2:1 ratio for idli as well as dosa ..is this the problem. ? keeping it in pre heated oven is good option. even i follow the same. usually 3:1 ratio is sufficient for dosa and for idli i use 1:1 ratio with urad dal and idli rava.